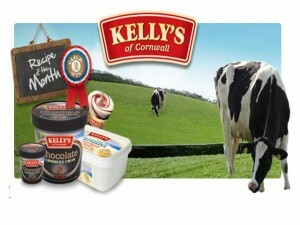 Kelly’s of Cornwall is a British ice cream manufacturer. In the UK market, it is also a leading brand when it comes to Cornish ice cream. Joseph Stafferi founded Kelly’s of Cornwall in the late 1890s. Stafferi started the business when he moved from Italy to the United Kingdom, where he settled in the area of St. Austell. Initially, his small business was engaged in marketing ice cream in the summer, and fish & chips in the winter. He made all the products that he sold. Stafferi’s son-in-law Lazero joined him in the business and started focusing on the ice cream products that the company sold. The company launched its first mobile unit with the use of a pony hooked to a cart. This is the origin of the current “Kelly’s Mobile Unit,” which currently has a total of 40 vans travelling across the Cornish beaches and other landmarks every summer. In the company’s early years, Kelly’s sold what was called the “penny lick,” a re-usable small shot-glass that was filled with Kelly’s ice cream. The “penny lick” was a hit to consumers, as it was delicious yet affordable, at a penny per shot-glass of ice cream. In the early part of the 1930s, the company’s name was changed to Kelly’s, which was easier to remember and pronounce. It was also in the same period that the company acquired its first van. The Morris Cowley van was seen travelling on the roads of St. Austell, selling the increasingly popular Kelly’s ice cream. Even in the company’s early years, Kelly’s ice cream has been made with whole milk and clotted cream. The ingredients are taken fresh from cows that forage on Cornwall’s verdant green grass. What makes Kelly’s ice cream popular and loved is its distinct creamy flavour, as well as its velvety smoothness. Kelly’s ice creams are a perfect treat to be shared at home, with the family and friends, especially in meal occasions. Today, Kelly’s Ice Creams are available in all of the UK. The brand and its products have already established a presence nationwide. Major retailers that sell this ice cream include Sainsbury’s, Waitrose, The Co-op, Morrisons, Tesco and ASDA. Kelly’s ice creams can also be found at any of the country’s tourist attractions and leisure sites.